AGP leaders addressing a press conference in Dibrugarh on Tuesday. 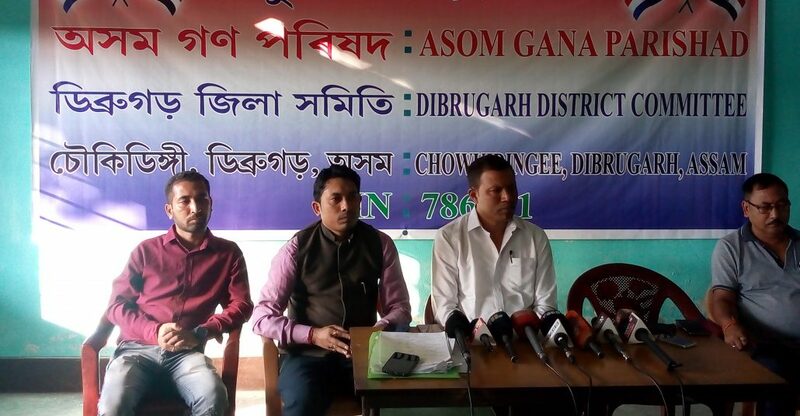 Dibrugarh district Asom Gana Parishad (AGP) on Tuesday announced candidates for the upcoming panchayat polls in Dibrugarh district. In Dibrugarh, the election would be conducted for 23 Zila Parishads, 7 anchalik panchayats, 93 village panchayats and 930 wards. Addressing the media at AGP office here, AGP Dibrugarh district president, Punakon Barua said that this time the performance of the party will be better in the panchayat elections. “Corruption and irregularities were rampant in the panchayat level during 15 years Congress rule. We will try to clean the panchayat from corrupt members by showing better result in upcoming election,” he said. He said the issue of Citizenship (Amendment) Bill will play an important role in the upcoming election. “We have given tickets to our candidates on the basis of their work and dedication for our party. We are a regional party and our top most priority is to strengthen regionalism,” Barua added. “We are against Citizenship (Amendment) Bill, 2016 because it will have an adverse effect on the lives of the indigenous people of Assam. The government is planning to bring Hindu Bangladeshi in Assam which is not acceptable. The bill should be scrapped immediately since the culture, language and identity of Assamese people are at stake,” he said. The panchayat polls in Assam will be held in two phases on December 5 and December 9 in 26 districts and 14 civil sub-divisions. The counting will take place on December 12.